How to Download YouTube Videos to MOV? As the most famous online video-sharing site, YouTube enjoy its great popularity among those who would like to spend their spare time in watching online video contents. However, every coin has two sides. YouTube videos are only accessible to people who have Internet access, which means offline playback of YouTube videos is out of way in most cases. Thus some people might consider downloading YouTube videos to their computer for offline watching. In most cases, videos downloaded from YouTube are contained in FLV, a format less acceptable by most video players. For playing YouTube videos on QuickTime player, a conversion from YouTube to MOV is necessary. Here I will show you how to convert YouTube to MOV with a YouTube to MOV Converter. Part 1: Why People Convert YouTube Video to MOV? As is said in the very beginning, the videos downloaded from YouTube in most cases are contained in FLV format as this format is popular over the Internet, and most video-sharing sites take FLV format as a priority. For those who employ QuickTime Player as their frequent media player to play back media files, FLV videos (YouTube videos) seem not to be a good option as QuickTime Player does not natively support FLV while MOV videos can be well compatible with QuickTime Player. Take those factors into consideration, people might want to download YouTube videos to MOV, and in order to achieve the aim, two separate processes are required. On the one hand, people need to download videos from YouTube with a professional online video downloader. On the other hand, people need to convert YouTube videos to MOV with a YouTube video to MOV converter. First of all, people need to download videos from YouTube. YouTube videos downloading can be easily processed with an eligible YouTube video downloader. Many people have spent much time and effort in searching a suitable video downloader but without getting a satisfactory result. But now problem is well solved with the introduction of Leawo Video Downloader. This video downloader from Leawo Software is designed to download videos from more than 100 online sites including YouTube, Facebook, Dailymotion, AOL, iFilm, Myspace, etc. Designed with an easy-to-use program interface, the whole online video downloading process is easy to operate. Powered by advanced technology, Leawo Video Downloader is 6 times faster in downloading online videos compared with other online video downloading programs on the market. 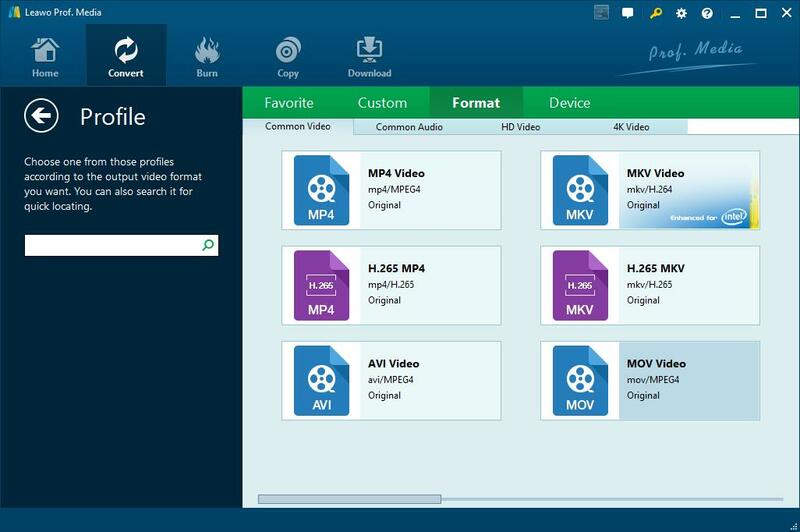 Not only as a video downloader, it can be regarded as a video manager allowing people to sort downloaded video files in a well-organized way. The program has a Mac counterpart as well. Download and install the right version of Leawo Video Downloader based on the operating system of your computer, and then kick off the program to get ready for the downloading process. Before you start to download videos from YouTube, you just need to download the right version of Leawo Video Downloader according to the operating system that your computer runs on. On the home page of the program, click “Video Downloader” icon at the bottom right to enter the main interface of Leawo Video Downloader. On the main interface of Leawo Video Downloader, you need to paste the URL of source YouTube file into the address box and then hit the green right arrow icon for going to the video. The internal browser and player will load and play the video file instantly. Click the little green arrow on the right side to unfold a list that shows all video files available for downloading. Each video file shows video length, video size, and video format. Choose your desired one(s), and then click the “Download” icon to add video(s) to downloading queue. The downloader will complete downloading soon. You can check the downloading process under “Downloading” tab, and manage downloaded video files under “Downloaded” tab. After getting YouTube videos, you can start to convert YouTube videos to MOV with the help of a YouTube video to MOV converter. Here in this part, I am going to introduce two ways to convert YouTube Video to MOV to you: one with Leawo Video Converter, the other with a YouTube to MOV online video converter. Check them out from below. 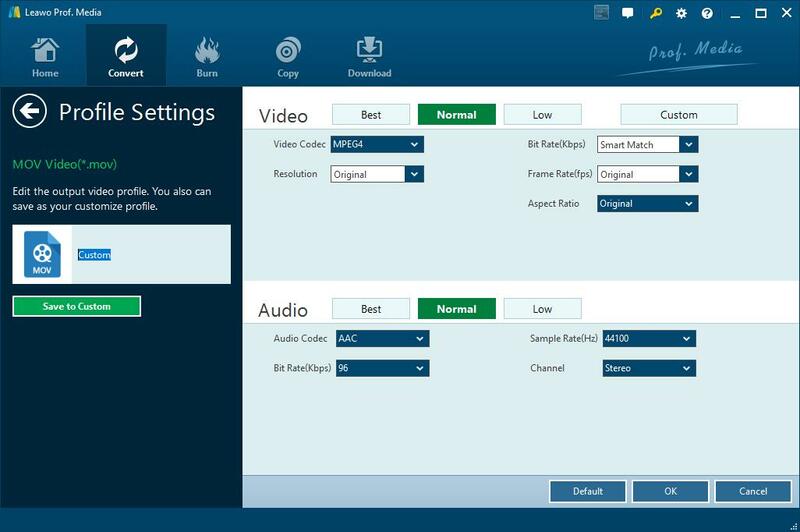 Leawo Video Converter is a professional video converting program able to convert video and audio files between more than 180 formats including MP4, FLV, MKV, AVI, RMVB, MOV, etc., and the program is able to convert YouTube video to MOV. The program is now integrated into Leawo Prof. Media. Follow the guide below to convert YouTube Video to MOV. 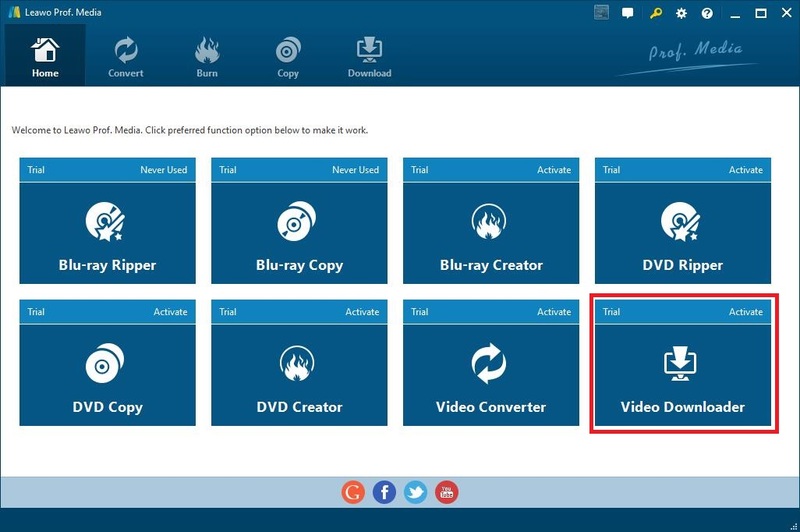 On the “Downloaded” tab of Leawo Video Downloader, you can right click a video file and choose “Add to Convert” to add the video file to Leawo Video Converter. After importing, you will see the below interface. Click the drop-down box at the right side of “Add Photo” button, and then click “Change” button to pop up a Profile panel where you need to choose “MOV Video” under “Format > Common Video” in order to convert YouTube videos to MOV. You can click “Edit” button instead of “Change” to call out Profile Settings panel where video and audio parameters in detail can be adjusted, including Video Quality, Video Codec, Video Resolution, Bit Rate, Frame Rate, Aspect Ratio, Audio Quality, Audio Codec, Bit Rate, Sample Rate, and Channel. Click the green “Convert” button at the menu bar to pop up a sidebar for setting an output directory to contain the converted results under “Save to” box, and then click the other “Convert” button at the bottom of the sidebar to start to convert YouTube videos to MOV. Besides Leawo Video Converter, I am to present to you a YouTube to MOV Online Converter for converting YouTube to MOV online. The name of this online YouTube to MOV converter is Zamzar. 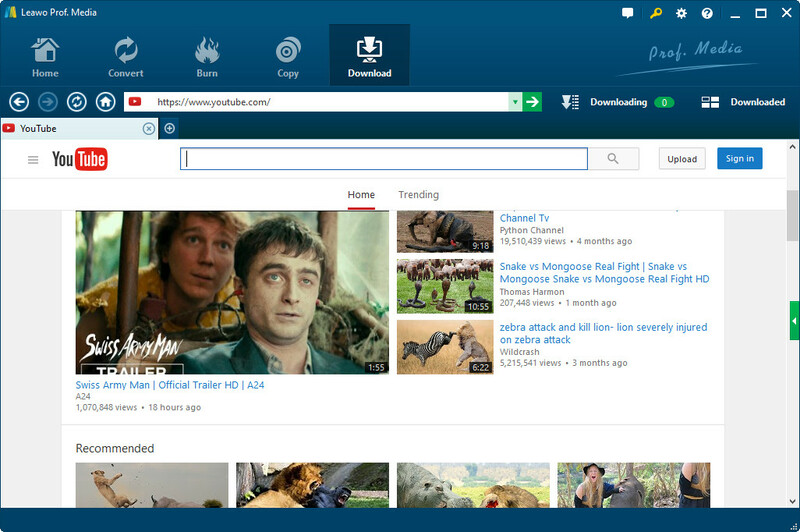 It is easy to convert YouTube to MOV online with this online converter. Step 1. Select source YouTube files you have downloaded by clicking “Choose Files…”. Step 2. Choose “mov” under the “convert to” list. Step 3. Enter your email address into the blank box to receive converted files. Step 4. Click “Convert” to start the conversion process. Online conversion might take longer. After the process completes, you will receive an email. You can download the converted result from the attachment. Downloading YouTube videos to MOV is easy to handle once you follow the step-by-step guide mentioned above. After getting YouTube videos in MOV format, you can start to enjoy YouTube videos on QuickTime Player in a smooth and easy way. Enjoy!